It is a cold day in Ireland, the 26th of December; frost lies thick on the blackthorn. A man walks the just-waking village, banging on every door, summoning the boys. Today is St.
Stephen’s Day, when legend has it that the Saint was betrayed by a wren’s call, and the boys are off to the forest where they hope to find the traitorous bird and capture it by nightfall. But what will they do if their prey escapes them? Inspired by the many myths of the wren and the Irish tradition of hunting it, Carol Ann Duffy’s beautiful new Christmas poem takes us on a chase through a snowy, rural landscape and ends with a merry celebration. 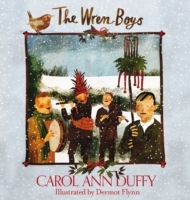 With gorgeous full-colour illustrations by Dermot Flynn throughout, The Wren-Boys will make a perfect stocking-filler this festive season.